Atlanta, Georgia's Dragon Con is a magical place for me, full of great friends from far off places, otherworldy cosplay, entertaining and informative panels, and--very important to this writer/musician--amazing bands. With the changing yearly artist lineup, I never know quite what to expect when each Labor Day weekend rolls around. 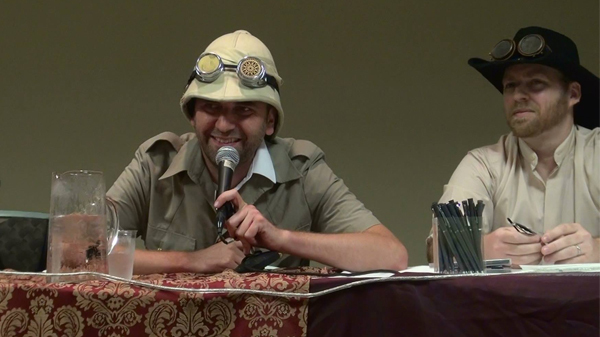 One of Dragon Con's largest "tracks" of programming is in fact the Alternate History Track (read: Steampunk Track). 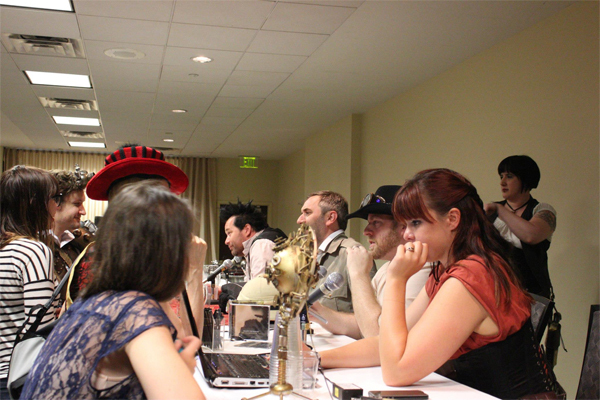 This year the track held a whopping 46 panels full of steampunk celebrity guests, welcomed a variety of steampunk musical artists, and hosted the biggest, baddest masquerade ball this side of the 19th century: the Mechanical Masquerade. Before I do the play-by-play, I have to give props to DJ and track director Doctor Q and his team for pulling off all of this amazing programming and keeping everything organized. They make it look easy. In the past, when going to see a new band, I would visit their site, watch their videos on YouTube, and otherwise familiarize myself with their music before going to their show. I'd had a crazy week leading up to Dragon Con and simply didn't have the time to do that. I went to Ms. Bright's show utterly in the dark--and that's an unintended pun. She and the four members of her band--drummer Seth Oldman, mandolin player Bradley Spencer, guitarist Diego Diaz, and trumpet player Bolshevik--crafted one dark poetic soundscape after another. Her songs tend to eschew traditional songwriting structure, leading you down wonderful twists and turns. "Corpus Callsoum" conveys the eternal struggle between left and right brain. "Misplaced Zygote", she explained, is about feeling you were born to the wrong family and struggling to fit in. The band alternated between moody numbers and infectious danceable pieces like "Especially Your Mother". Video of Crystal Bright and the Silver Hands performing "Corpus Callsoum"
Ms. Bright's music may be dark, but her stage presence was very charming and offbeat. 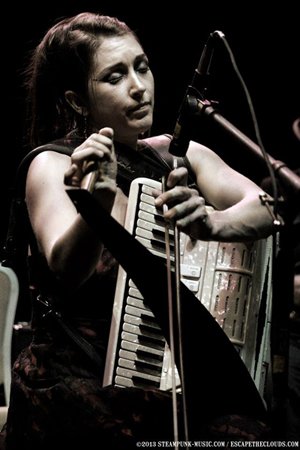 Besides her lead vocal duties, she deftly played a world's worth of instruments: accordion, concertina, adungu (a small Ugandan harp), piano,and musical saw. Trumpet player Bolshevik was a show unto himself, at times acting as if he were a dutiful automaton, adding mechanical percussion with a shaker on his leg, other times delivering brassy flourishes and scorching leads. The band as a whole ably carried out the atmospheric, vibrant nature of the songs. Crystal Bright playing her musical saw. Bizarre side note: I ended up inadvertently becoming part of the show! As part of their performance, Crystal uses a large taiko-like drum, which requires a pair of taiko drum sticks. Unfortunately, those sticks had gone missing. Well... after their set I was going to go to the nightly Dragon Con drum circle, so I just happened to have a pair of marching drum sticks on me. I passed them on up to the stage, and the show went on! 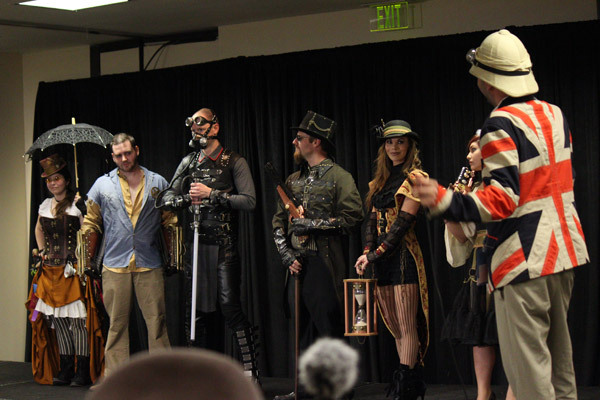 In between a multitude of non-steampunk panels, I caught the Alternate History Track's Biscuits and Bowlers at Dawn event, a combination tea-dueling match and fashion show. 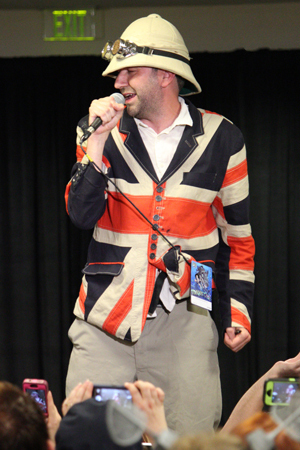 Professor Elemental proved himself a cheeky and hilarious MC, keeping the crowd and participants entertained throughout. Before and after the fashion show, he also performed "Animal Magic"--complete with audience-created animal sounds--and "Cup of Brown Joy". Professor Elemental dropping some "Animal Magic". The fashion "duel" involved pairs of contestants striding on to stage and striking their best poses in their phenomenal costumes. Everything from steampunk X-men to a riff on Spy vs. Spy to complex, motorized armor creations were present. Both the contestants and crowd showed some sass as the audience voted with applause for their favorite from each pair. Some of the most impressive costumes on display. Unfortunately, due to a prior engagement, I couldn't stay for the tea dueling portion. Professor Elemental promised some "street rules" dueling involving some possible shenanigans. Steampunk-music.com's sometime-correspondent Sean Peck was present and I'm sure he captured it on video. Hopefully he'll post something soon. 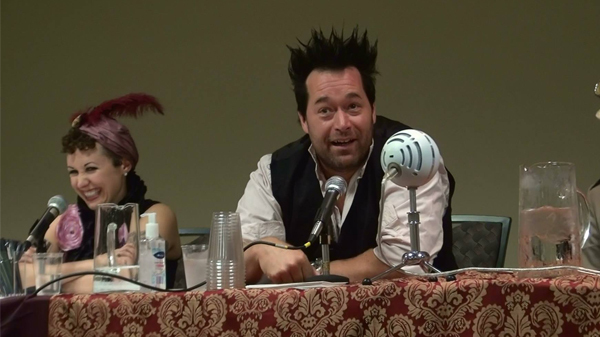 On Saturday afternoon, I was invited to be a panelist on the Steampunk Music Summit with Robert Brown of Abney Park, Erica "Unwoman" Mulkey, and Professor Elemental. We were asked some great questions by panel hosts Dr. Alyssa Rosenbloom (from Behind the Steam) and Emmett Davenport (from Clockwork Cabaret). Emmett played the part of steampunk Oprah, running up and down the aisles, fielding inquiries from the packed audience and track director Doctor Q. 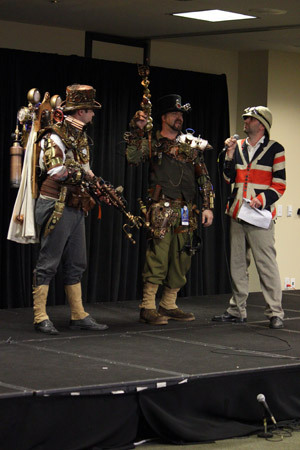 We each spoke about our own experiences and perspectives as makers of steampunk music, including our inspiration, themes, and where we think the whole thing is headed. 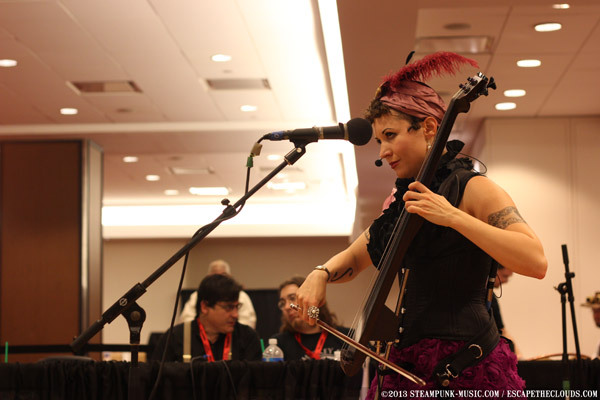 It's always interesting to see how each artist got drawn into the steampunk music fold. For example, Unwoman was more or less adopted by the community. 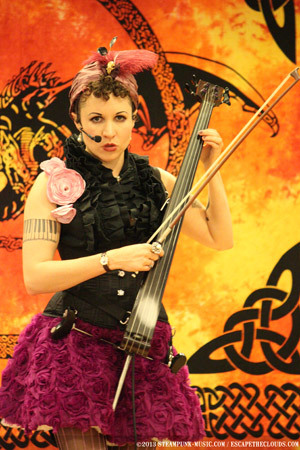 Abney Park was introduced to it by their former dancer/vocalist, Magdalene Veen. We each took such different journeys, but more or less wound up in a similar thematic destination. The panel was such a great experience. We laughed a lot, got serious at some points, and made the time pass all too quickly. Amongst the audience were several other musicians, including Crystal Bright herself, Veronique Chevalier, and the members of Valentine Wolfe. Braxton from Valentine Wolfe started a wonderful discussion with Professor Elemental about the the power of music as an educational tool. The hour ended with some giveaways for the audience members from each of us panelists. behind us all is Emmett Davenport. Veronique Chevalier is in the red hat, directly ahead of me. Dr. Rosenbloom recorded audio of the whole thing, and just posted the panel's audio to her blog Behind the Steam. Listen in below and hear what everyone had to say! Later in the afternoon/evening, I caught Unwoman's performance on the Hyatt's concourse stage, a venue for primarily acoustic performances. I'm certainly a fan of her work, and a while ago, we even collaborated on a track via the Internet. Strangely enough, even though we'd worked together on music, I'd never actually seen her in person or even communicated with her outside of email! Such is the world of online music collaboration. Unwoman performing on the concourse stage. Unwoman's impassioned voice and lyrics intertwined perfectly with her haunting electric cello tones. Her music is at times lush and atmospheric, other times stark and direct. She employed a loop pedal to layer both the cello and vocal harmonies, building soundscapes. One of my favorites from her performance was a track exclusive to The Artifice Club Compilation Vol. 1, "Beauty Over Industry". She described it as the closest she's come to writing a steampunk anthem. Many of her originals--like "The City" and "The Heroine" are dramatic studies of relationships and the damage they leave behind. She expresses these heavy themes with both great elegance and lyrical ferocity. She also played a variety of covers in her own unique style. Two of her most recent albums are actually covers CDs. She performed "Brand New Day" from Dr. Horrible's Sing-a-long Blog during the set I watched, and the theme from Firefly during another set. Unwoman performing the theme from Firefly during her set the following day. The crowd she drew filled up the concourse area. After her show she was swarmed by fans. Not wanting to interfere with her well-deserved attention, I hung back until the crowd had dissipated. I ended up barely being able to say hello before she had to rush to sound check with Abney Park, with whom she was playing later that night. The crowd taking in her performance. Meanwhile, I ended up running into my friend Davis Petterson, the drummer from Ghosts Project, who was getting some Con time in before going back home to his new baby. He said Ghosts Project would be applying to Dragon Con again next year. After playing it seven years in a row and adding their music to the Dragon Con's theatrical acts like the Atlanta Radio Theatre Company, they took a two year hiatus. I really look forward to seeing them back in the mix. Press on to the next page and conclusion of this recap, including videos and pictures of Professor Elemental, Unwoman, Abney Park, and Voltaire!